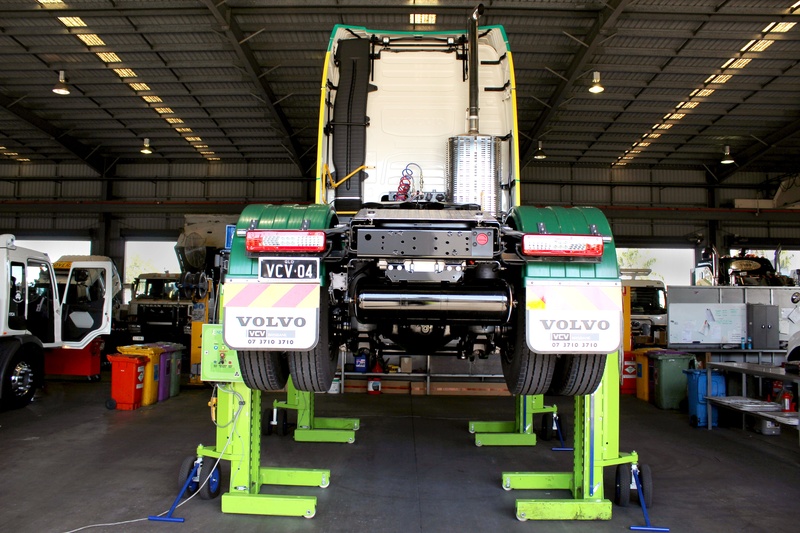 Volvo Commercial Vehicles is one of the most demanding workshops in Brisbane and turned to Endurequip as their partner to help them continue their operations. 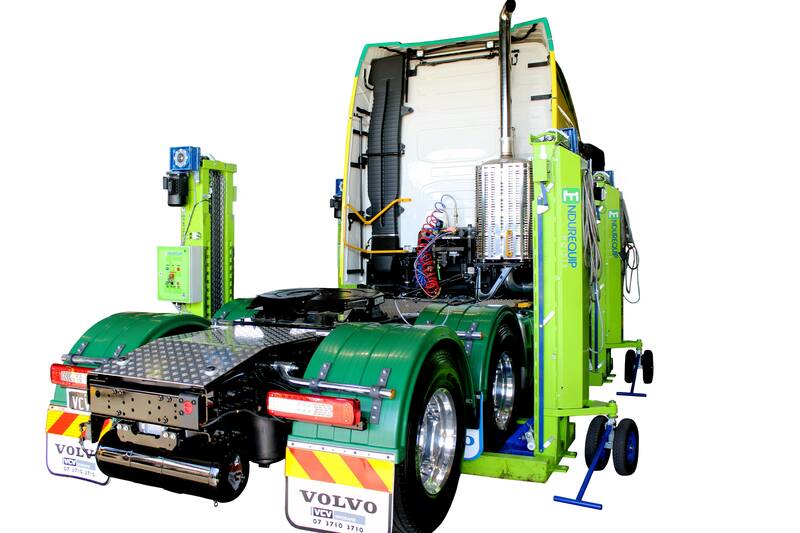 Volvo were actively seeking a trusted partner to increase their workshop efficiencies in order to support their technicians, whilst ensuring their safety and wellbeing. Able to provide full underbody access to the trucks. 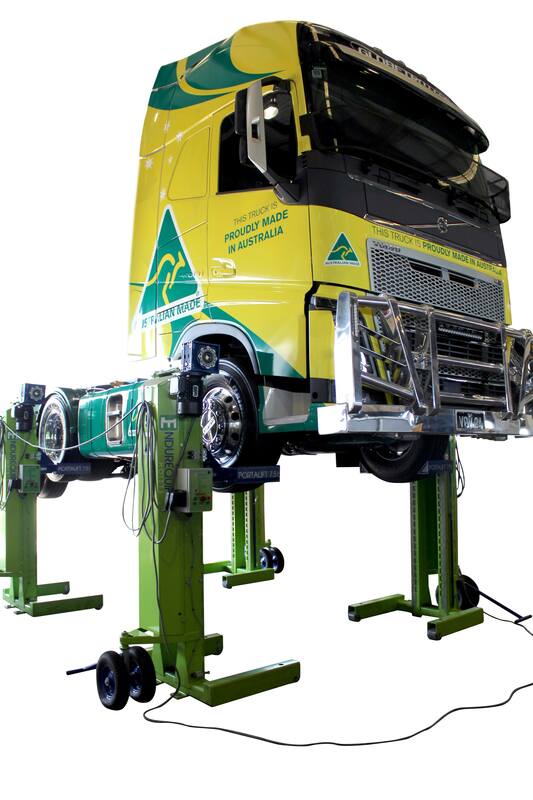 Rodney wanted to set up VCV’s workshop with the best heavy vehicle hoists the market has on offer, in order to maximise productivity, efficiency and ensure the safety of his technicians. 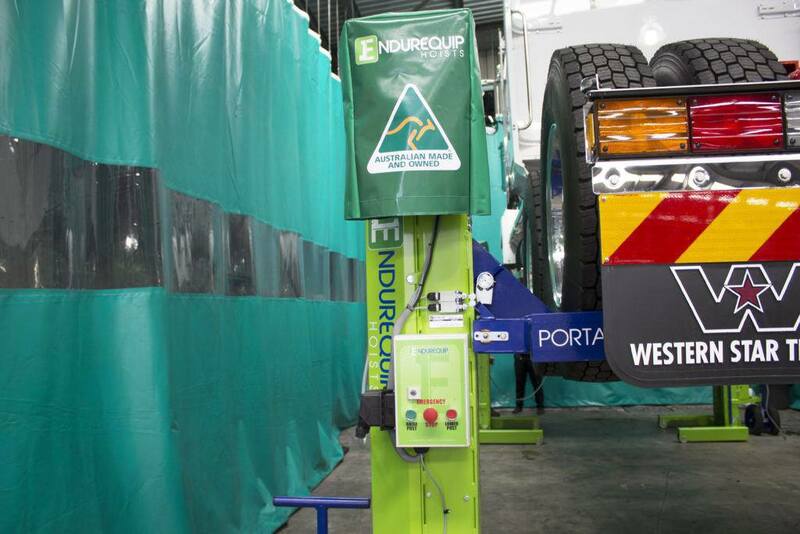 Endurequip Portalift Hoists ticked all the boxes and was the perfect solution for VCV’s Wacol, Nerang and Pinkeba workshops. Complete underbody access and simple system design with dual control options – resulting in faster and cost effective work. 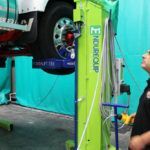 Simple to use – the lifting system can be operated by a single technician saving time and increasing flow of the workshop. High quality design and engineering – provides peace of mind that employees are safe at all times. 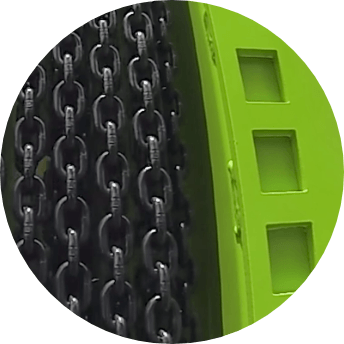 RUD calibrated high quality chain drive – less maintenance and less wear on equipment. 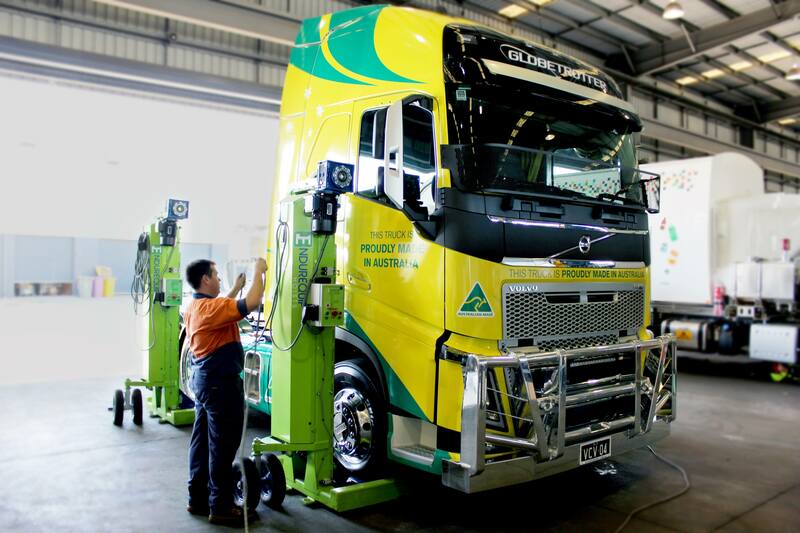 Entirely Australian made – with ongoing local service and support. 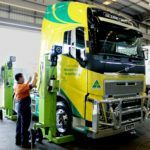 “Similar to Portalift, our trucks are proudly Australian made, so we know how much attention to detail and quality engineering goes towards products that also carry the iconic ‘Australian Made’ logo,” Rodney acknowledged. For more information on any of our products or services get in touch with our friendly product specialists for a personalised approach to your needs. Call us on 07 3809 1399 or get in touch. 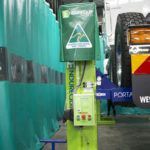 Endurequip Portalift Hoists are being used throughout Australia by small businesses looking to save money and time, whilst increasing productivity. 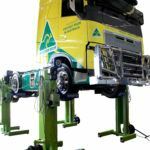 A new small business, located in QLD, approached Endurequip for a quality heavy vehicle hoist solution to help kickstart their operations. Dan’s Truck Detailing is a recently established business founded by Dan. The company provides a reputable truck detailing service that cleans, corrects and protects the paint surface, as well as spray paint designs for truck fleets of all shapes & sizes. 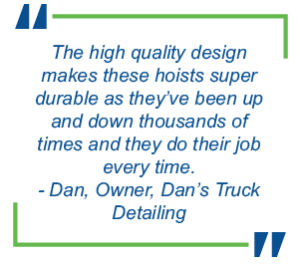 Dan knew he needed a durable, reliable hoist that would provide full underbody access to the trucks, which could also be permanently used in the wash bay. 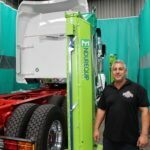 With Dan’s experience in the trucking industry, he also understood the important of quality and safety in his workshop equipment to boost productivity, maximise convenience and provide a secure working environment. –Complete underbody access equipped with duel control options, gives the user a choice of where they want to be, safely. –Entirely Australian made that comes with ongoing local service and support. –RUD calibrated high quality chain drive mean less maintenance and less wear on equipment. –Flexible because of dust proof and water resistance features, which means you can set up anywhere. 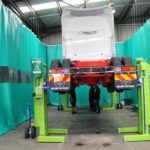 –Portable as the Hoists can be moved to any location without installation. 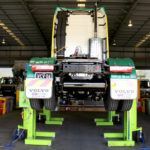 “Through working in the truck game for a while, I’ve seen a lot of truck hoists. Endurequip’s Portalifts are the most convenient and portable for a one-man job. The hoists simply roll in and out and you can adjust them to whatever size you want. As they are easy to use, this saves us time and increases flow in the workshop,” Dan stated. 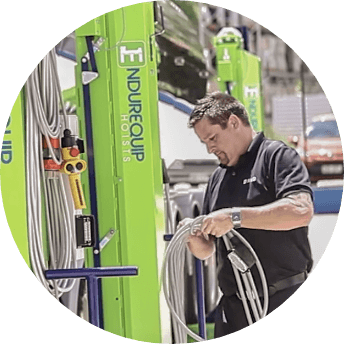 “The customer service from the Endurequip team has been outstanding,” Dan acknowledged. “There was a specialist who came out to set the hoists up and trying us in their use. He also maintains them on a regular basis. You don’t get this type of service with equipment that is made overseas. 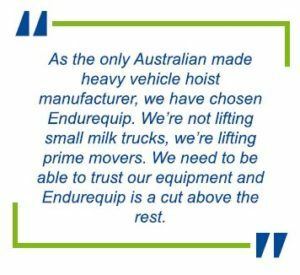 This is one of the main reasons why I wanted to do business with Endurequip because their equipment is entirely made in Australia. It is a lot less stressful knowing that you have Endurequip Hoists on your doorstep willing to help you out. 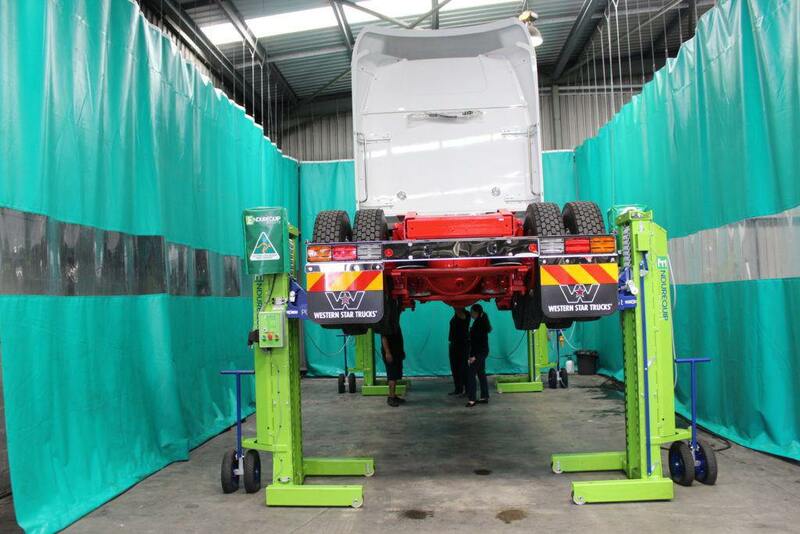 I set up my workshop the right way, with the best quality, safe and durable equipment. I am glad that I didn’t try to cut costs by working with a company that manufactures their equipment overseas. 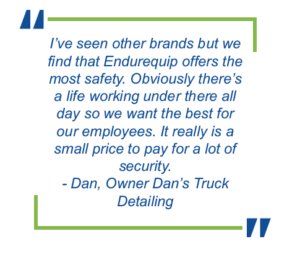 At Endurequip, we believe in the core values of quality, durability and safety. We know how hard you work and we design our products to work right along with you. We use the finest materials combined with the best in efficient design. 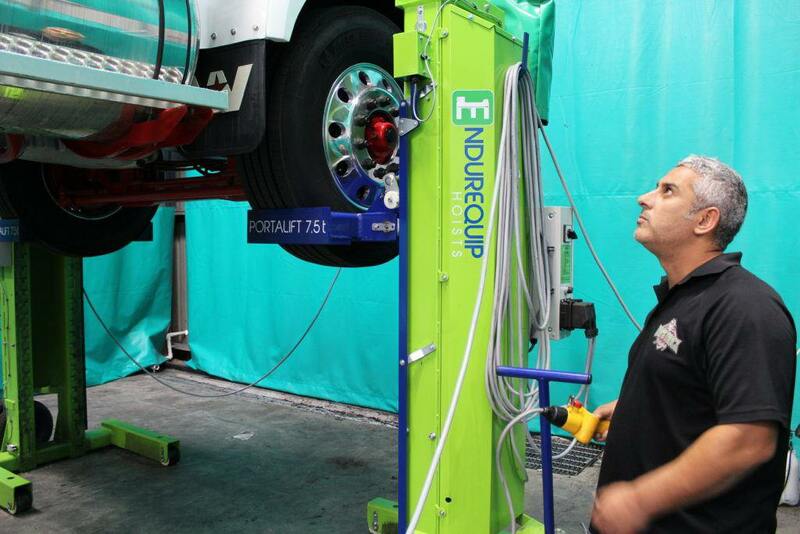 Endurequip products are completely flexible, easy-to-use and extremely low maintenance. 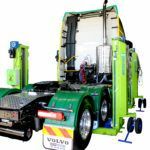 Most importantly, our hoists are designed to anticipate every heavy vehicle scenario and address it. Your work is tough and you need something equally strong to help you. Endurequip products are engineered to keep working no matter the conditions. All products have a structural life of 25 years! They are dust proof and water resistant, which means you can set up anywhere. Features like our special RUD calibrated high quality chain drive mean less maintenance and less wear on your equipment. So you can keep right on working. Protecting your valuable team members is high on Endurequip’s list of priorities. 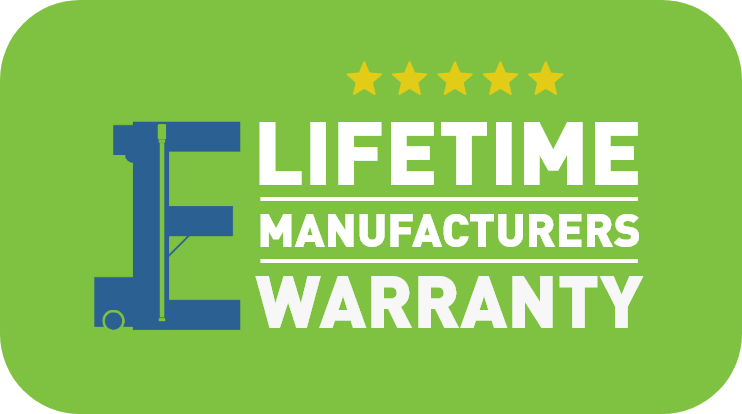 That’s why our products feature every safety consideration possible. 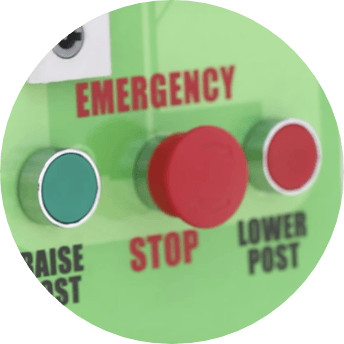 From emergency stops to keyed safety locks and remote control panels, we aim to keep you safe. Call us on 07 3809 1399 or click below.